“It’s not what you want,” as Bird’s former manager Joe Girardi would say, but that dropped throw aside — it did not figure in the scoring of the Yankees’ 5-4 win over the White Sox — defense hasn’t been Bird’s primary problem. At a time when the Yankees have been without Judge, Sanchez, and Didi Gregorius due to injuries, Bird is in an 0-for-21 slide since homering in his first plate appearance against the Blue Jays on August 19, and hitting .114/.186/.228 with two homers in 86 plate appearances in August. His 10 wRC+ for the month is the lowest of 177 qualified hitters in that span. And that’s after I suggested it was fair to quibble with including him on the first-base list in my Replacement Level Killers series just prior to the July 31 deadline. Overall, he’s hitting .196/.284/.384 (80 wRC+) this year, and through 640 PA over his three-season major-league career, he’s at .213/.302/.435 for a 97 wRC+. That’s not going to cut it. A fifth-round pick in 2011 out of a Colorado high school, Bird rocketed from Double-A to Triple-A to the majors in 2015, filling in for the injured Mark Teixeira and emerging as the first baseman of the future by recording a .261/.343/.529 with 11 homers, a 137 wRC+, and 1.1 WAR. Alas, he lost all of 2016 to a torn labrum in his right (throwing) shoulder, then spent 2017 battling pain in his right ankle that resulted in midseason surgery. He returned in late August and hit .253/.316/.575 with eight homers in 98 PA, a big step up from the .100/.250/.200 he had hit in 72 PA through May 1. Further problems with his right ankle, caused by a bone spur that required surgery, sidelined him until mid-May of this season, while the Yankees muddled through with Tyler Austin and Neil Walker as a rather ineffective platoon at first base. 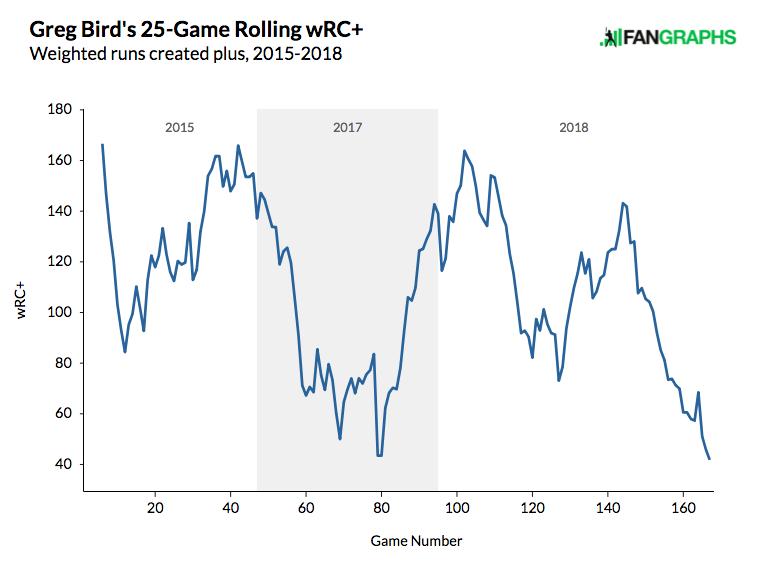 Despite Bird’s low batting average — the result, in part, of a pull-heavy approach (47.0% this year) that’s vulnerable to infield shifts — he appeared to be getting it together, hitting .233/.325/.455 for a 109 wRC+ through the end of July. Then this month’s nightmare, and a stretch of watching newcomer Luke Voit, a 27-year-old, righty-swinging rookie, start four games out of five while going 8-for-15 with three homers, just the shot in the arm the Yankees’ offense needed. Drafted as a catcher in the 22nd round in 2013, the beefy (6-foot-3, 225-pound), boyish-looking Voit was acquired from the Cardinals on July 29 in exchange for pitchers Giovanny Gallegos and Chasen Shreve, a move that allowed the team to send the 26-year-old Austin to Minnesota along with 19-year-old pitching prospect Luis Rijo in exchange for Lance Lynn. After the July 31 trade deadline, Eric Longenhagen and Kiley McDaniel rated him as a 40 FV prospect while describing him thusly: “Low-OBP first baseman with power. Solid 1B/DH depth behind injury-prone big leaguers.” While he may be more suspect than prospect, thus far, he’s hit .265/.328/.469 for a 113 wRC+ though 177 major-league plate appearances. For the moment, he’s a solid alternative to Bird. All statistics through August 27. Bird has gone from stinging the ball to… not stinging it. While he’s generally getting elevation and distance, he’s lacking in oomph. His infield fly-ball rates have been at 13.3% and 12.5% in July and August. Those are basically automatic outs. Minimum 200 results against pitches classified by Gameday as four-seamers, two-seamers, and sinkers. Bird’s xwOBA is the 16th-worst among the same group, and his wOBA-xwOBA differential is the 19th-worst. None of this is where he should be. Fortunately for Bird, even in the absence of so many big bats, his teammates have been picking up the slack. Aided by a soft schedule in which they’ve played just three games against teams .500 or better since being swept by the Red Sox from August 2 to 5, the Yankees have gone 16-6 in their last 22 games, whittling Boston’s division lead from 9.5 games to 6.5. 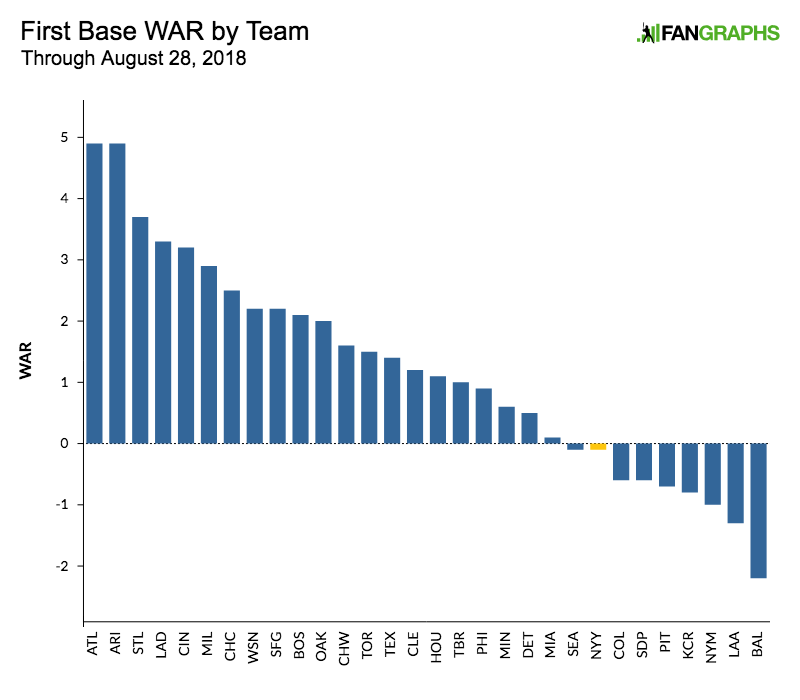 They’ve scored 5.19 runs per game in August, just a whisker below their season rate. All of that is buying the scuffling first baseman some time, but if he doesn’t start producing soon, Bird’s opportunity may fly out the window. We hoped you liked reading Things Aren’t Going Well for Greg Bird by Jay Jaffe! “From Bird to Turd” wasn’t approved by the editors for the title? One of my fantasy teams was named “Bird Ferguson” for most of the year. That and Senzel Washington have been my 2 favorites. Heh, its funny cuz the hype.ya know, Its bigger than , normal hype.